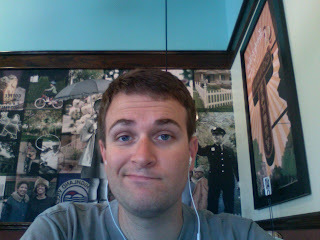 Sitting at Corner Bakery using their free wifi and eating breakfast. Trying to prepare for my first job interview since returning home. Pretty nervous. It's a phone interview, so at least I won't have to concentrate on forcing myself to stop fidgeting with my hands. And I won't have to wipe my sweaty palm on my pants before shaking hands with my interviewer. Still pretty nervous. I typically interview well. Acting skills at work and all that. It's a one-man performance called "Every Positive Quality I Possess and Some I Don't." Typically performed in three acts. Job hunting is all about patience. Waiting to hear back on applications, hoping to hear from some jobs over others, counting the minutes, hours and days that go by. It's like fishing without the beer. Then when you finally get past all the modern filters (online application, resume request, background check, reference check) you get to speak to a person. Then you get to sell yourself. Without sounding too much like you're selling yourself. It's a complicated dance. I'm a little bit rusty on the steps. Which is why I'm prepping for the big sales pitch over hot tea and scrambled eggs. I'm distracted though. My mind keeps wanting to go over our moving plans for tomorrow. We've decided to move into an apartment for a year. We've discovered some serious commitment issues with settling on a house and a home. We think time and more research is the solution. And if we find the location of our dreams in three months, we can always buy the lease out and be on our way. But I'm really not looking forward to two more moves in the near future. Moving is a singularly loathsome activity, both for the expense and the hassle. For such an involved activity, surprisingly little of it is very interesting. But we're both ready to be living in a space of our own again, however temporarily. Well, I'm going to get back to prepping for my sales pitch, er interview now. Wish me luck! Did you get the job? This company has never seen the likes of you. Do you know this band Blind Pilot? Good. And love the new apartment. Living lush, dude.